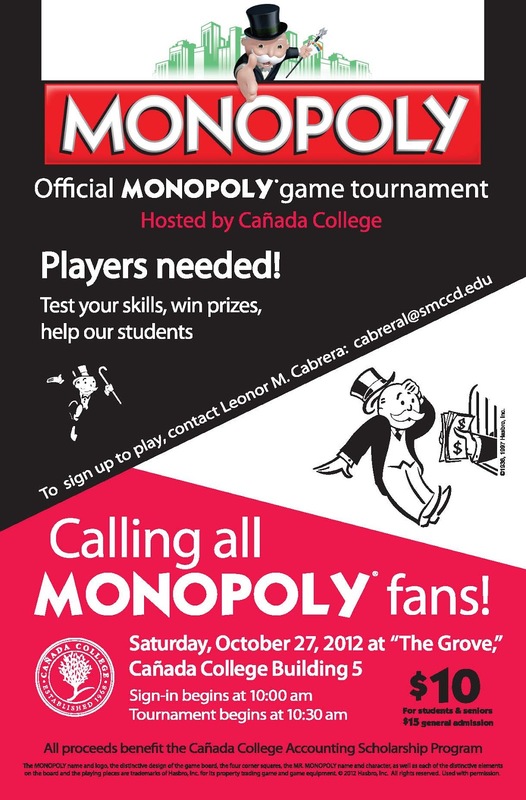 Cañada College will host its third annual Monopoly Tournament on Saturday, Oct. 27. Registration begins at 10 a.m. and tournament play begin at 10:30 a.m. All proceeds fund the Cañada College Accounting Scholarship. The tournament will be held in "The Grove" located in Building 5. The tournament is open to everyone. Students and seniors are $10 and the general public is $15. Pizza and water will be provided to participants between the two 90-minute tournament rounds. This year's grand prize is a Kindle Fire. There will also be a silent auction and raffle prizes. If Monopoly isn't your game, you can join the UNO Attack game that occurs during the tournament or bring your own board game and enjoy the atmosphere. In the past, this event has raised nearly $1,000 for student scholarships. To register to play, contact Leonor Cabrera at cabreral@smccd.edu.